Whether you’re throwing a disco-themed party, a rock-and-roll sock hop, or just a children's party where you’ll have music and space for dancing, these dance party games are sure to get kids moving and grooving in the spirit of fun. To play this dance party game, you’ll need one person to work the spotlight and another to work the music. Have that person stand in the middle of the dance floor and shine a flashlight on the dancers. The spotlight person should continually move the flashlight so that it is always changing which dancer it is highlighting. Whenever the person in charge of the music stops it., the spotlight holder must freeze, steadying the light on the dancer it was pointing to at the time. That dancer is out of the game. Play continues until only one dancer remains. Another variation of this game is to have the dancer the light is shined on when the music stops move to the center of the dance floor and perform her best dance moves for the crowd. This way no one is eliminated from the game and everyone gets a turn to shine in the spotlight. 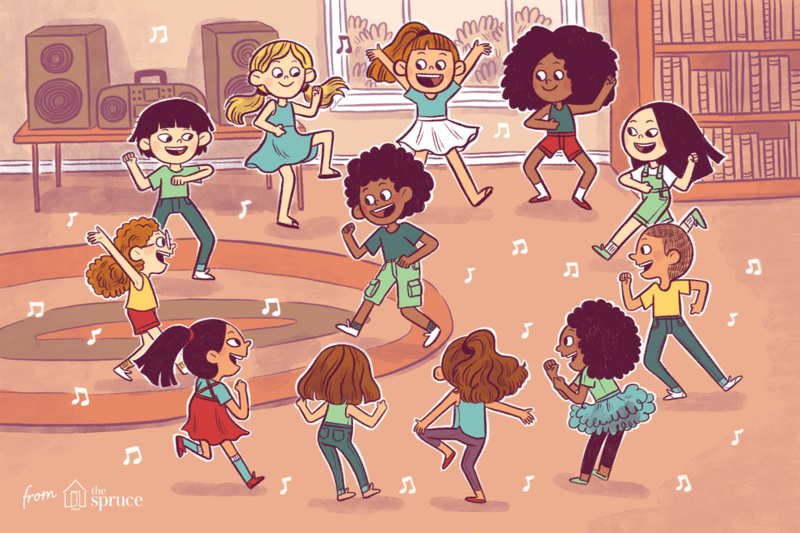 To play memory moves, have the kids form a circle around the dance floor. Choose one player to go first. That player will step into the center of the circle and make up a dance move. The next player will step into the center and repeat the same dance move. After that player mimics the dance move of the first player, he then performs one of his own. It is up to the next player to repeat both dance moves and add a third. The game continues in this manner, which each dancer repeating and then adding a new move to the list. Anyone who can’t copy or forgets the succession of dance moves is out. Play continues until only one dancer remains. This game will have dancers team up in couples. Each couple must dance only in a designated spot. The best way to do this is to tape large circles onto the floor and have dancers stand on them to start. Play music and have them dance together without stepping off of the circles. When you speed up the music, they must speed up their dance. Anytime a foot steps out of the couple’s spot, that pair is out of the game. To make this game more challenging, you can start with large circles and replace them with smaller ones as the dancing progresses. Assign one player to stand in the middle of the dance floor and hold a flag. Have the remaining dancers form pairs and begin to dance around the flag holder. At random times, the flag holder will toss the flag in the air. When the flag goes up, everyone switches partners. The flag holder must also try to find a partner. The person left standing alone becomes the new flag holder. Play music and have the kids dance randomly. Stand alongside the dance floor and randomly call out different dance styles, such as disco, ballroom, hip-hop or ballet. Whenever a new dance style is called, players must switch their dance moves to suit that style. Forget the macarena or the cha-cha slide. Get kids to invent their own dance moves. Have them line up as they would for line dancing. One at a time, have a player step forward and perform a move. All dancers will work on that move a few times before the next player will add a move. Each move will be practiced along with the ones that went before. By the time all players have added and rehearsed their moves, the new dance will have been invented. Hand out two or three hats to the dancers. As the music plays the hats must circulate among the dancers. Every time the music stops, the players wearing the hats earn a prize. To make sure everyone earns a prize, have the players who win sit out for the remainder of the dance game. Before the party, write down several things that might pertain to party guests such as “the girl with the ponytail” or “the person wearing glasses.” Put all of the written items into a hat. As the kids dance, pull the items from the hat and call them out loud. Anyone who fits the description must leave the dance floor. The last player on the dance floor wins. Mark off four corners with four different colors. This can be done by hanging a colored flag or taping a piece of colored paper to the floor in each corner. Write down the four colors and place them in a hat. Once the kids are dancing for a bit, stop the music and tell them to run to a corner. Pull one of the colors out of the hat. Those players are out, and that corner is eliminated from play. This version of musical chairs is a great way to incorporate a childhood favorite game into your dance party. Instead of lining the chairs up in the middle of the room, set them up so that they circle (or semi-circle) the dance floor. Kids dance, and when the music stops, they head for the chairs, but instead of running, they must dance their way over to the chairs. As usual, the player left standing when all the chairs are taken is eliminated, a chair is removed, and the kids return to the dance floor for the next round.